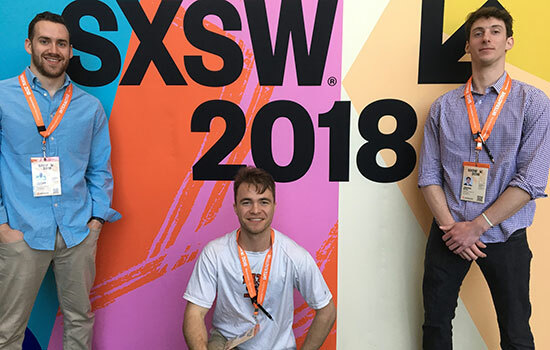 Some of the Gaia team members were able to travel to Texas in March of 2018 to present their business pitch at Student Startup Madness at South by Southwest. Joseph Clifford, left; Brent Chase, center; James McGee, right. Gaia, a company founded by RIT alumni, was featured in an Inc. article listing the top eight “Coolest College Startups” as named by the Student Startup Madness competition at South by Southwest. This company is almost entirely run by RIT students and alumni. Co-founded by Brent Chase ’17 (biomedical engineering), Joseph Clifford ’17 (mechanical engineering) and Liam Herlihy ’17 (electrical engineering), Gaia’s aim is to “help prevent, mitigate or decrease the frequency of meltdowns for children with autism” by utilizing wearable technology to detect these intense responses to overwhelming situations before they occur. Inspired by his little brother Alec who was diagnosed with autism spectrum disorder, Chase, co-founder and CEO of Gaia, wanted to find a way to help his brother avoid the pain and loss of normalcy that these meltdowns brought him. “I’d watch how a blissful walk through the park would turn into complete agony at the mere sight of one of his triggers,” said Chase. Much of the current solutions are reactionary and can only help the problem once it’s started, so Chase needed a better solution. To help both his brother and other individuals with autism, Gaia is able to utilize smart apparel to create an emotional profile for the individual wearing the clothing. Using this information coupled with a mobile or web app that is in development, a parent or caregiver would be able to sense and monitor that information to be used as a way to detect or predict meltdowns in an individual with autism.